She tells me that the only way to help her now is through prayers, but I have long forgotten the right way of praying. I no longer remember what it means to look up to a god. Everyday I watch her limping in pain, carrying the weight of two crosses, one on each shoulder, the second one so starkly familiar. The mere sight of it—the haunting memory of once carrying it as my own—leaves a bitter taste in my mouth. Everyday, I see her clothes stained by blood and sweat and tears and my own sins. As always, my hands shake, wanting so badly to take the cross off of her. If I could, I’d take both and pull her out of this misery. But she always refuses to let them go, reminding me that this is her responsibility when I know it ought to be mine. I do not deserve to be saved from the struggle when struggle is the only purpose for my being. I try to recall the words to the songs of praises, the pleas for forgiveness. I run my fingers through each bead of the rosary, hoping to remember how to use it. I pick apart the insides of my brain, looking for the remnants of my broken faith, but all I see are the nights when I drowned myself in uncertainty. I wear my constant guilt for not knowing how to pray. If faith is the unit of measuring the love of a daughter, then I deserve to be condemned. I do not believe in a god, but I believe in her. I do not know if this is enough, but I believe in her. I have no words left for prayers, but I believe in her. The sign of my cross is embedded on her shoulders, and we both bleed at the same time. I believe in her. I hope one day she also learns to believe in herself. 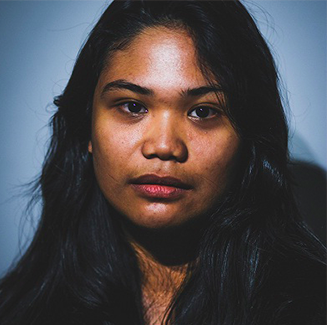 ELIZABETH RUTH DEYRO is the Founding Editor-in-Chief of The Brown Orient, the Fiction Editor of Rag Queen Periodical and |tap| lit mah, and the Nonfiction Editor of Cauldron Anthology. Her work has appeared in or is forthcoming from Ellipsis Zine, Jellyfish Review, Black Napkin Press, L'Éphémère Review, and The Tempest. Find her on notjanedeyro.wordpress.com.